The most efficient and cost effective electrolytic recovery system ever. The Gold Bug® is used very successfully with all of the precious metals including silver, palladium, palladium-nickel, platinum, rhodium and iridium. 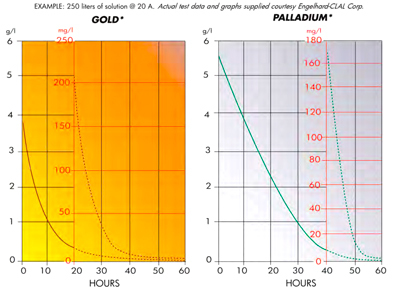 Various types of solutions of copper, cadmium, tin, tin-lead have all been successfully treated to concentrations of less than 5ppm with the Gold Bug®. Undetectable levels are sometimes possible to obtain. The Gold Bug® is able to bring relatively large volumes of solution with concentrations of metals all over the spectrum to environmental compliance levels in many cases. This is done quickly and inexpensively. In fact, do not let the price fool you. With confidence, we invite you to try it on us and match it against any other system available. Use it for thirty days and send it back if you are not satisfied. That is our guarantee! Twenty five years ago, when I was a beardless boy of little more than fifty, bearded, long haired and with a motorcycle helmet under your arm, you were somehow allowed to enter my office, and present your “fantastic” claims that your new invention was going to save us hundreds of thousands, if not millions. Pretty tall claims for a hairy hippie like young man. However, I figured anyone looking like that could not be a con man, so I agreed to let you put one of your “Gold Bugs” into the dragout of one of our heavily used gold plating tanks. A month later you returned and extracted over 40 ounces of gold from this one tank, essentially tripling the yield we’d been getting from our prior method. Not being too stupid, we immediately installed “Gold Bugs” in all our tanks with similar spectacular results. Though I can’t say that the use of your devices was the only reason for our very substantial growth; however, since we normally invest most of our profit in growth, it was a substantial reason. Obviously a company that sacrifices a large part of their bottom line to loss of precious metal in solution rinses is sacrificing profit and growth potential. Enough encomiums; little did I know that day 25 years ago would be the beginning of a lifelong friendship. I only have two complaints, first, you sing off key which makes it impossible to sing a duet with you. Also, it’s been years since you picked up a lunch tab, maybe you should raise “Gold Bug” prices so you can afford to do so. Editor’s note: Mr. Epner has characterized Mr. Seidler’s first complaint as “spurious”, citing the real reason that duets between them are not possible is because Mr. Seidler is hopelessly off key. While Mr. Epner concedes Mr. Seidler’s second complaint, he prefers to have Mr. Seidler continue to pick up tabs rather than have to raise his prices to his other valued customers and prospects. The Gold Bug is King! We use it for our gold recovery and it does a remarkable job. We have also found it to be quite useful in recovering the palladium from our electroless copper activator solution. When the bath is spent, The Gold Bug is able to remove all the palladium to low concentrations. While the deposit is not always perfect, the results are quite satisfactorily. I am surprised that we are the only ones that you know of using it in this manner. I was one of your very first customers, over 20 years ago. The very first time I got the results from your Gold Bug System, I absolutely was taken aback at the incredible yield returned that I had been missing for the 40 years that I was in business prior to meeting you. We have used your Gold Bug for gold and silver recovery for 20 years. I can tell you that this was the single best investment in equipment I have ever made, bar none.I have read your website and honestly say that you do not overstate your case. Artistic Plating dba Advanced Plating Technologies has been plating precious metals for nearly 68 years. In that time I have tried many recovery techniques to mitigate the inadvertent loss of those valuable metals. I have used ion exchange resins, bi-polar electro-winning systems and closed loop rinsing schemes. I can honestly say I like your system the best. 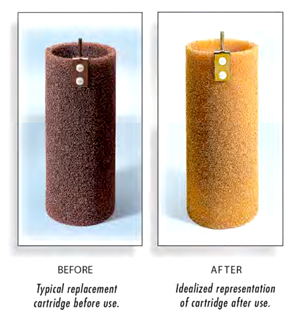 The “Gold Bug System” uses disposable cartridges rather than non-disposable stainless steel electrodes and thus saves labor in removing the captured metals. It saves the mess, labor and time of having to scrape plates. Additionally, because there is more cathode surface area in a given solution volume, plating from low concentration baths at reasonable current densities is possible which allows for improved metal capture. I can weigh the cartridges before and after and get a fairly good idea of the amount of metal present. This provides an accurate estimate of the metal being sent to the refinery. I can dissolve or melt these cartridges for even better accuracy. 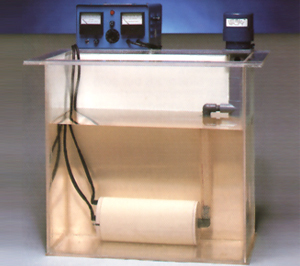 The system is compact and takes very little room in the drag-out tank. The system is safe and requires little maintenance. What can I say is this is a great product. I wish I had thought of it! We have at least eight Gold Bugs on our gold and silver drag-out tanks. When you’re talking about gold at $430 an ounce, you have to be nuts not to put one of your gadgets on the rinse. 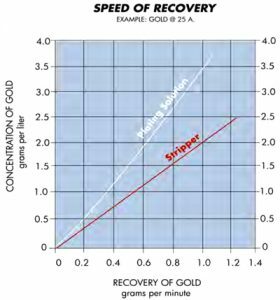 Even when you’re talking about silver, the dual aspects of metal value and effluent containment make the Gold Bug a natural. We also use the Gold Bug to plate-out all of our spent plating and stripper solutions. The end point: 1-2PPM! Suffice it to say that you have made our company quite a bit more profitable than it would have been had I been attacking this problem in some other manner. You have always been prompt and helpful whenever we have needed anything. Thanks. We have used your Gold Bugs for nickel and copper over the last nearly two years and only very recently put it on our gold tank. In the case of nickel, for various reasons, we use it offline every evening in our holding tank. The concentration starts around 1500ppm. By morning, the concentration is down to two hundred ppm. In conjunction with other technologies, this decrease is enough to keep us perfectly clean. In the case of copper, the Gold Bug is on-line and constantly keeps our drag out very low. We have not yet seen our results with gold. I am quite optimistic. Just because I run Epner Technology and your name happens to be Epner, and just because I have known you for most of my adult life and we are friends, still that would not be enough for me to give your Gold Bug® and Ionnet® sytems a heads-up if they were not our products of choice. And they certainly are! We have used them for years and there is nothing better. At Epner Technology, we are involved in the most esoteric and complicated plating problems imaginable. Our reputation, solving these problems for nearly 100 years, is mostly impeccable. The visitors to your website can check this out at our website: www.epner.com. We would never do anything to sully that hard-earned reputation. Both of your products that we use, the Ionnet® system and Gold Bug® system, perform flawlessly. They are absolutely maintenance-free and just work, constantly assuring us that the heavy and precious metals in our drag=out tanks are as low as possible. We use them to batch treat solutions as well. Dear Randy: Your company was recommended to us by one of our outside vendors so that we could de-plate one of our spend gold baths. At the time, I was not aware how valuable your product would be to our operation. We ordered three of your Gold Bug systems initially to recover from our strip solutions, plating baths, and especially our drag-out tanks. As the director of technology at this company, I was somewhat skeptical of your claims, in terms of the absolute efficiency of your product. However, after careful analysis of our tanks, the Gold Bug amazed us because it was able to remove the metals to remarkably low levels, i.e. 1 or 2 ppm, very quickly. I am sure this is because of the very low current density that you operate at because of the very large surface area contained in your cell and the turbulent flow designed into the system. We have sinced ordered 8 more such systems. We use them to recover our gold, silver and even palladium from our electroless seeding process. We are also planning to use one in our copper drag-out. Your refining service has also been exemplary. Our turnaround time was less than one week, and the return was right at our theoretical estimate. We paid for all systems with the very first yield from them. It has been quite a remarkable investment. I thank you for coming to Chicago immediately, at my request, to talk about what it is that you do. As may be obvious, I wholeheartedly recommend your product and service to any and all who may read this letter. When my secretary told me you were on the phone, I must confess, I did not even know who you were. I really should have known, as any product that we have used as long as we have used yours, I should know who makes it. It’s a sensational product. We have used Gold Bugs in our many rinses as long as I can remember, as least two decades but probably three, or more. The reason is simple: they just work and work and continuously keep our precious metals where they belong, in our possession rather than on the floor in the effluent or down the sewer. I would hate to hazard a guess as to how much your invention has saved us over all these years. I shall only say you have helped keep us competitive over some very rocky periods. To anyone viewing this testimonial, I would say try it, you will be hooked.